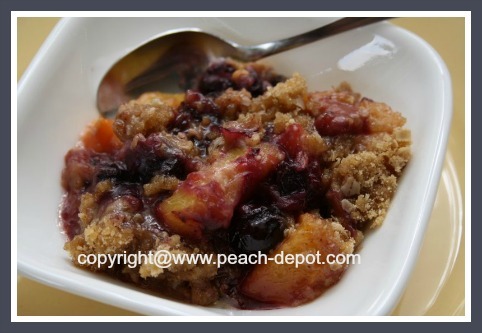 A Peach Blueberry Crumble Dessert Recipe made with oatmeal and fresh OR frozen peaches and fresh OR frozen blueberries for the best peach-blueberry recipe ever! 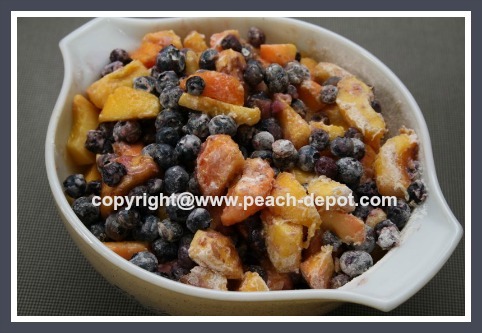 I just made this scrumptious fresh peach dessert using fresh peaches and frozen blueberries. Check out the mouth-watering recipe pictures, and let's get baking! It's a quick and easy dessert! In my opinion you can't beat a crumble with oatmeal topping! 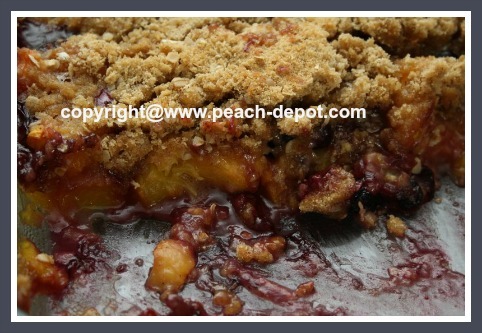 There is plenty of crumble for this recipe that, if desired, it can be made in ONE 9" x 13" baking dish or TWO 9" or 8" square dishes. Perhaps share with a friend? 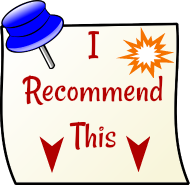 I made a full recipe of the crumble topping, however, if you wish to have less topping (for a lower calorie crumble), you can easily reduce the ingredients by one-half and still have an amazing scrumptious crumble dessert! Note - If you are using frozen blueberries, thaw them ahead of time in a bowl, over a sieve, and discard the excess liquid. 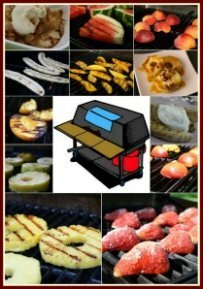 If you are using frozen peaches, allow the peaches to partially thaw, and use them as they are. Whisk the sugar, flour and cinnamon together in a large bowl. 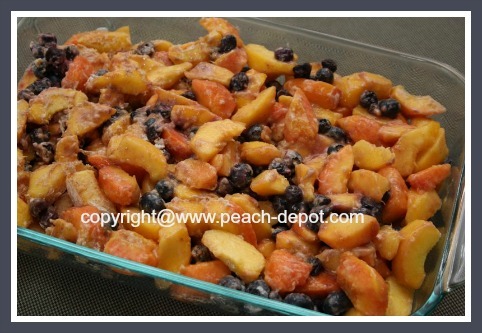 Add the prepared peaches and blueberries to the mixture and toss to coat. Transfer the fruit to ONE 9" x 13" baking dish (or TWO 8" or 9" square dishes). Measure the topping ingredients into a bowl, and cut in the butter using a pastry blender or two knives, or your fingers(! ), until the mixture resembles coarse crumbs. 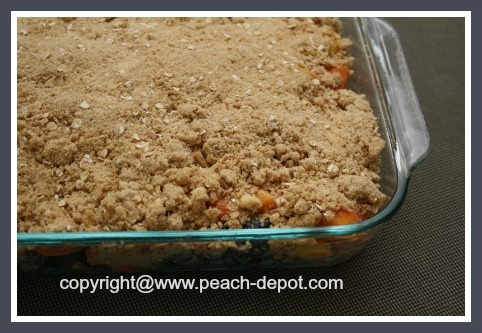 Sprinkle the crumble mixture over the fruit in the baking dish. Bake at 350° F for about 30 minutes or until the fruit bubbles up. 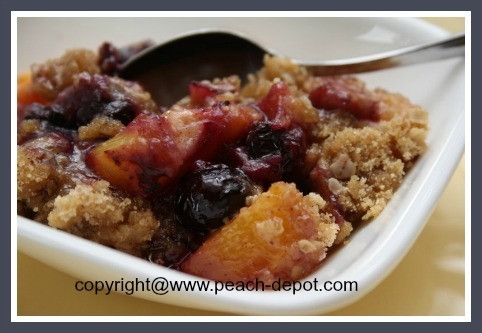 An Amazing Fruit Crumble Recipe!